Checking beforehand is of vital importance. See the checklist below. Before you drive off with a bike carrier, trailer, caravan, boat trailer or horsebox attached, we recommend that you perform a check before beginning you’re journey. The tyres are the only point of contact between the trailer and the road. We therefore recommend always checking the tyres of the trailer, caravan, boat trailer or horsebox for cracks before beginning you’re journey. The rubber of the tyre becomes harder and more brittle due to the natural ageing process. The harder rubber causes the tyre to heat up more quickly. Hot air expands, resulting in all the ingredients for a burst tyre. If the tyre pressure is too low, it can lead to a burst tyre as well. Therefore, always check the tyre pressure. Ideally, the tyre pressure lies somewhere between 45 and 50 pounds (always check the specified pressure with the tyre manufacturer). If the tyre pressure is less, the trailer will start to ‘bounce’ behind the car. The tyre pressure does not only tremendously affect the safe handling of the trailer, caravan, boat trailer or horsebox. A tyre that’s too soft increases the rolling resistance and therefore the fuel consumption of the towing car. In addition, higher rolling resistance results in the tyres heating up faster, increasing the risk of a burst tyre. While you will hopefully not need it, it is advisable to always check your spare tyre too, as well as the tyres of your car. 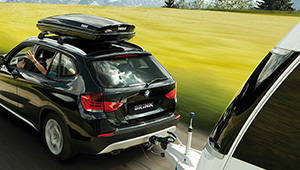 In order to have a safe drive, you will have to properly connect the car with the bike carrier, trailer, caravan, boat trailer or horsebox. The most important connection between both is the coupling of the towed object being attached to the towbar. Always check this coupling for severe wear and tear. Logically the coupling wears due to friction with the towbar, as it is steel on steel. It is therefore recommended to use sufficient lubrication. The towbar ball is subject to wear and tear as well, which is why the size of the ball is measured during a technical inspection of the car. If the ball has a diameter of 50 mm at purchase, the diameter has to be at least 49 mm during technical inspection. If the ball is too small – or the coupling too large – due to wear and tear, it may be that some leeway occurs: the coupling moves on the towbar. Depending on the measure of wear and tear, it may happen that the bike carrier, trailer, caravan, boat trailer or horsebox may slip off during driving. In addition, it is important to ensure that a detachable or retractable towbar is properly locked. Our detachable and retractable towbars are equipped with a clear red/green safety indicator. This ensures a check beforehand is easier. A bike carrier, trailer, caravan, boat trailer or horsebox can break loose from the towing car during driving due to technical malfunctions or because of extreme manoeuvres. 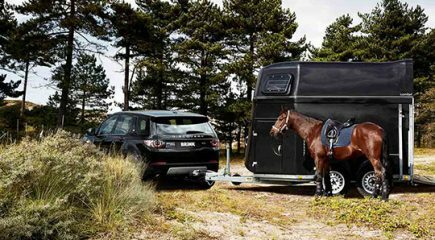 In order to limit the consequences of such an accident, you can connect unbraked trailers, caravans, boat trailers or horseboxes (up to 750 kg total weight) to the towbar by means of an additional steel cable and secondary coupling. This cable connects the drawbar of the trailer with the towbar, ensuring the towed object will always remain behind the car. The cable is locked in place by an additional fastening eye on the towbar. Regularly check the cable and ensure it is fastened properly. Driving with a trailer, caravan, boat trailer or horsebox requires a great sense of judgement. Exterior mirrors are extremely important to be able to have a good view. If you have a caravan behind your car, special rules regarding vision apply. Once you are unable to see through the interior mirror, you are obliged to mount a right exterior mirror. Visibility is important, but being seen at least equally so. You have to make sure that fellow road users are not troubled by the beam of your headlights. Due to the weight of the bike carrier, trailer, caravan, boat trailer or horsebox, almost every car comes up at the front, so that the headlights can blind fellow road users. You will, therefore, have to adjust the headlights. For some cars, this is an automatic process. If that is not the case, you will have to manually adjust your headlights. Finally, check whether the indicators, reverse lights, fog, tail lights and brake lights of the bike carrier, trailer, caravan, boat trailer or horsebox are functioning properly. The car-trailer combination is now ready to go. Checking beforehand is of vital importance. Read more about lightning.